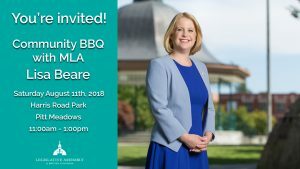 Come join MLA Lisa Beare for a community BBQ at Harris Road Park in Pitt Meadows. Meet your neighbours, talk with your MLA and have a bite to eat. This is a family friendly event and we will have activities for children.